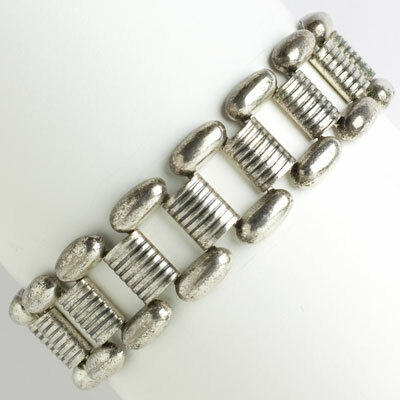 An unusual example of vintage German jewelry, this silver link Machine Age bracelet was made by Württembergische Metallwarenfabrik (WMF). This German company is best known for its Art Nouveau and Art Deco silver-plated tableware. 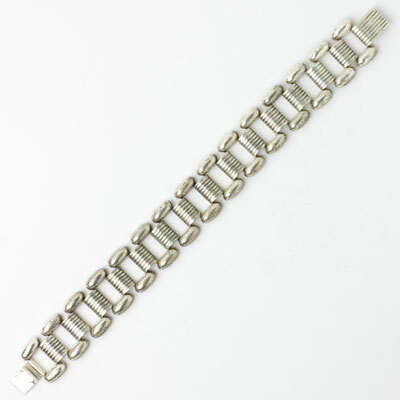 This silver-plated link bracelet from the Ikora line closes with a concealed clasp. The warm patina is the result of the oxidation process the jewelry department used in its manufacturing. This wonderful bracelet is attractive, yet neutral enough to be worn with a variety of attire for a range of day and evening activities. Scroll down to see some Machine Age necklaces to wear with this piece.